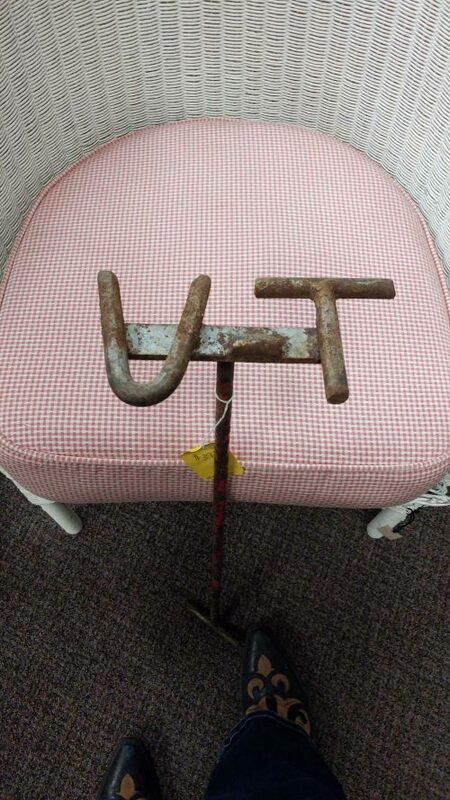 Look, a “TV” brand — as in a branding iron to imprint “TV” onto your cattle. Or your couch potatoes? 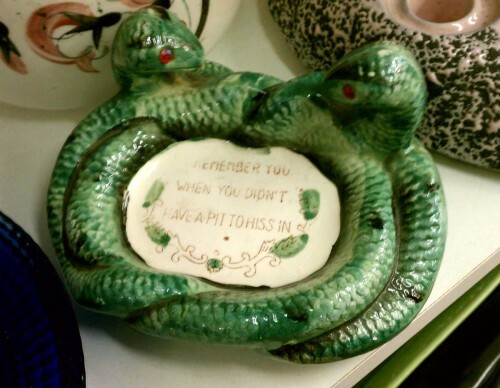 Spotted at one of our local antique malls. 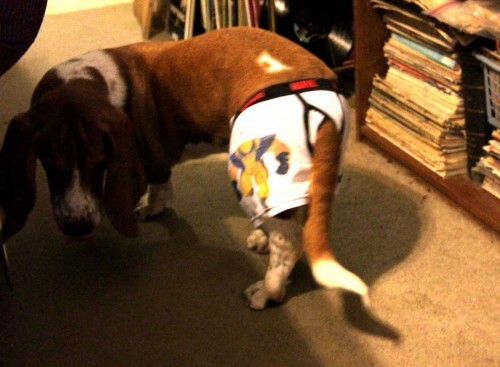 I am finally getting through all the random, potentially amusing, pics on my phone. So check my other blogs, here & here especially. This is Spinal Tap, a mock rockumentary. 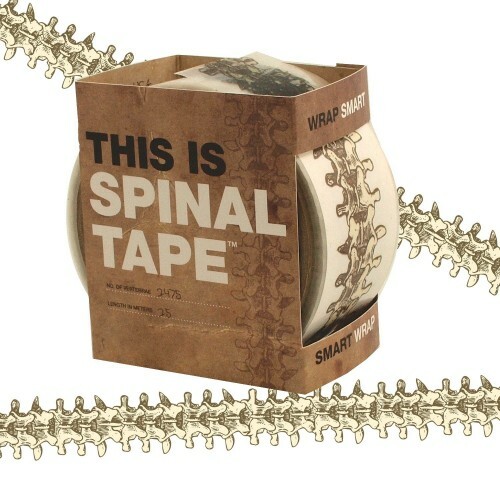 But This Is Spinal Tape, packing tape with real backbone. …Well, it’s illustrated with spinal cord, anyway. According to the reviews, it’s more decorative than structurally sound for packing up boxes. I have this thing now where whenever an ad tells me to do something, I turn it around and tell them to do it. 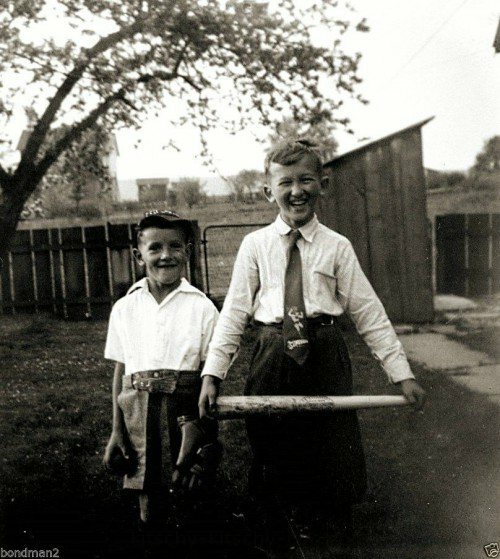 For example, when the commercial announcer says, “Right now, you can get 0% financing,” I reply — yes, out loud, with “No, you get 0% financing!” Hubby swears it never gets old. Heh. In this case, even if sounds threatening or at least a bit naughty, Piff’s is just a vintage soda pop. 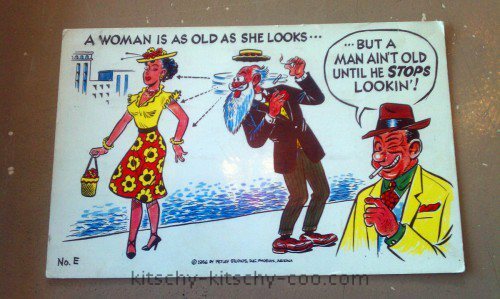 Normally I post this sort of sexist stuff over at Kitsch Slapped. But I felt general kitsch lovers might like this too. Postcard No E, copyright 1956 by Petley Studios Inc., Pheonix Arizona. Petley Studios was started by Bob (Robert Teeple) Petley in 1946. The studio began with twelve black and white humorous postcards — but would later become the nations largest publisher and distributor of scenic color postcards. In 1984, Petley was sold to Bruce Finchum. This vintage gag postcard was spotted at Antiques On Broadway, Fargo. But he wore his Superman tie and pretended that’s what the fuss was all about. Via . Didn’t have a pit to hiss in. 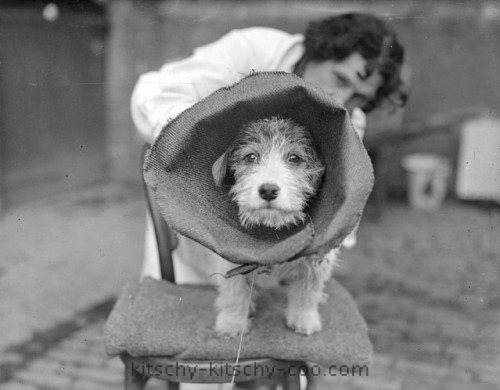 PS Been rather busy with our antique business; but now that the flea market season is over for us, we’ll have more time to scan & blog again. 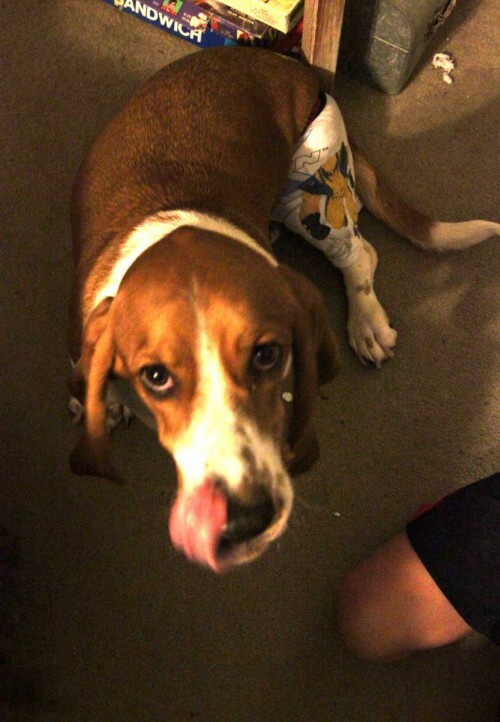 This has been on my bucket list for long long time — at least as long as we’ve been waiting for Mr. Oliver T. Puddington, our Basset Hound puppy. Well, I’ve been dreaming of putting Puddington in a little lederhosen. 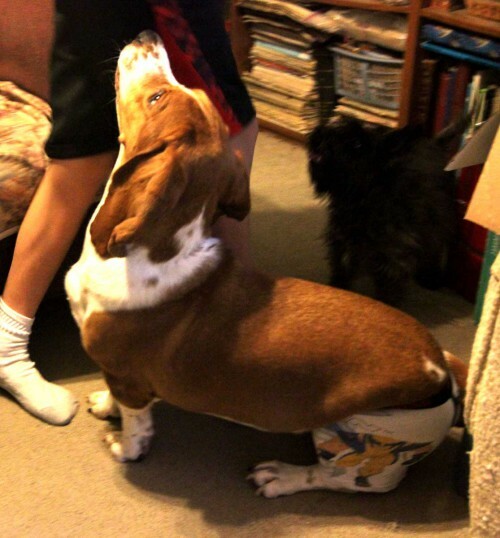 (Dressing French dog in German pants seems quite American to me.) 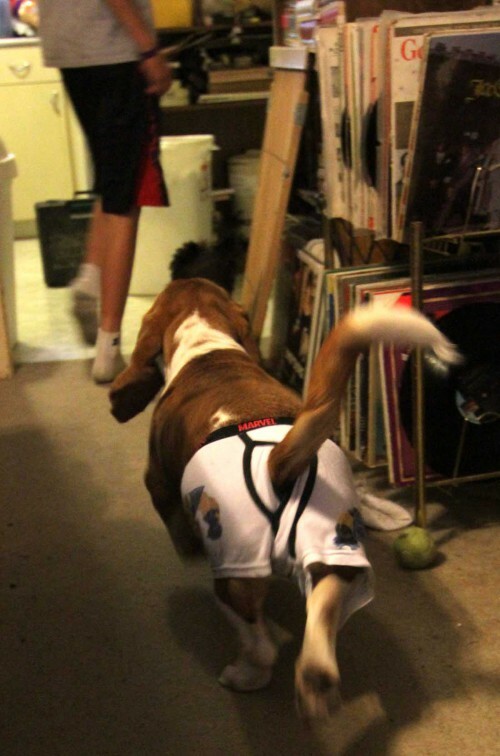 I thrill at the idea of little tiny short pants and the long suspenders required to cover a Basset Hound’s long torso. 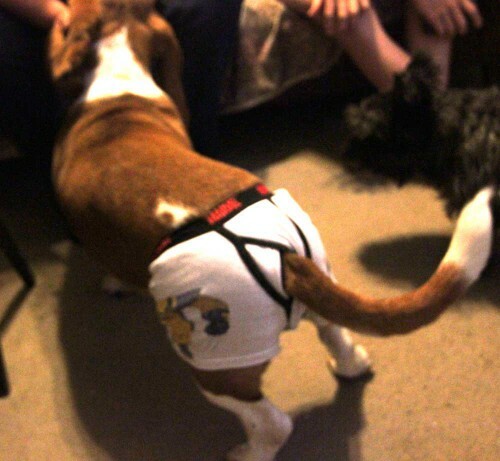 But since hubby won’t invest in little leather pants for our pup, we have to make do with what we have: boys underpants. 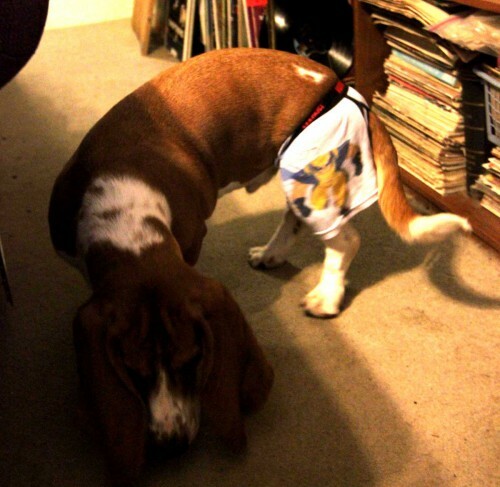 Hey, at least hubby and our son (who wants me to be clear demands I state that these are not his underpants!) were willing to humor me and go this far. Anyway, last night, the magic happened! 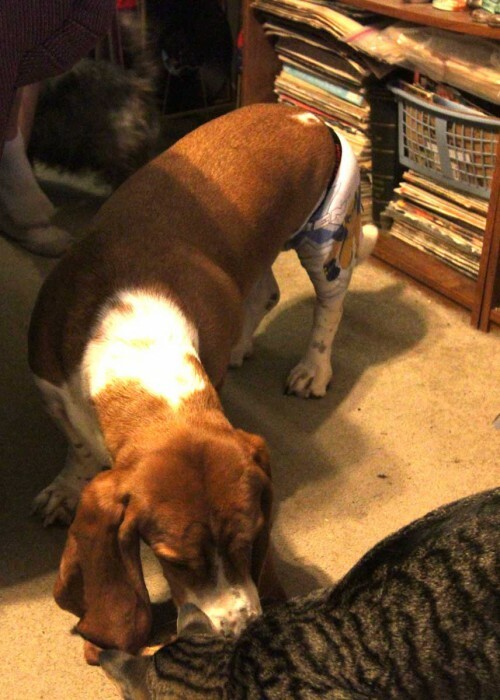 Oliver was incredibly patient and willing as we put the small underpants on his back end, tucking his long tail through the little flap. 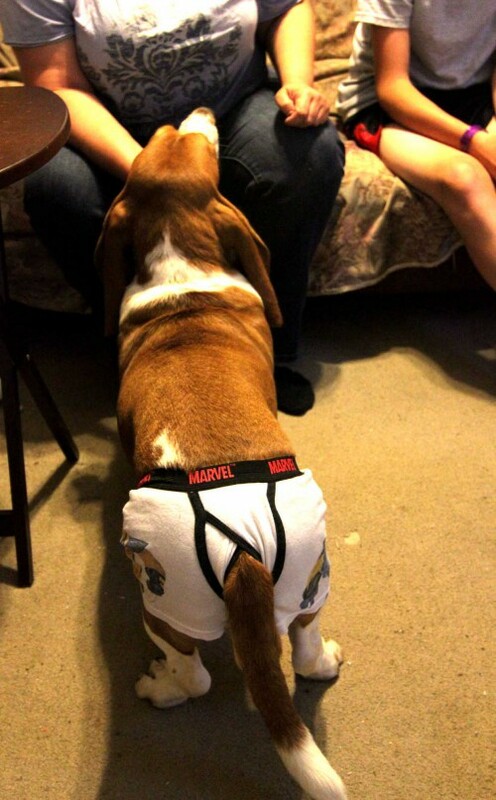 Doesn’t Mr. Puddington look Marvel-ous in his comical comic-themed underpants?! 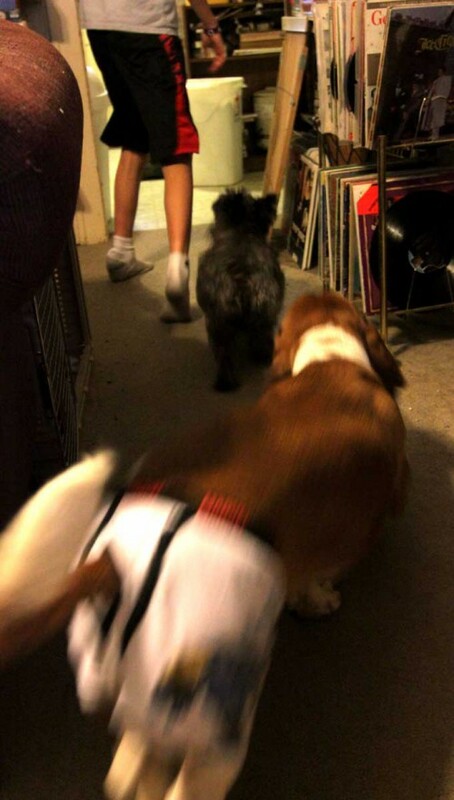 When Oliver went to follow our son, Hunter, for a treat, Oliver’s fist step in those underpants must have felt odd, for he made a little funny hop with his hind-end before he trotted off in pursuit. Puddington had been so patient, I felt bad that he shared his treat. 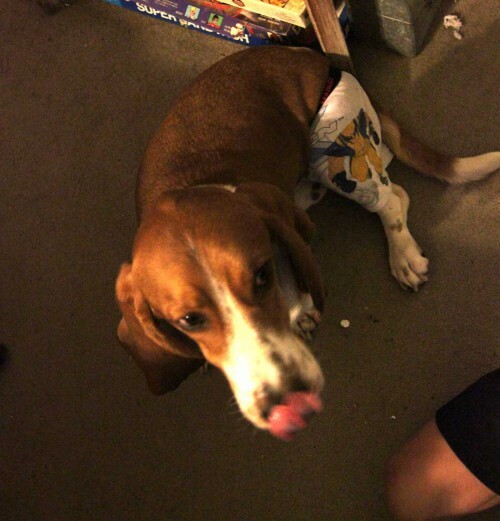 So we gave him another one that he could have all to himself once we removed his underpants. Yes, I giggled myself silly the whole time. 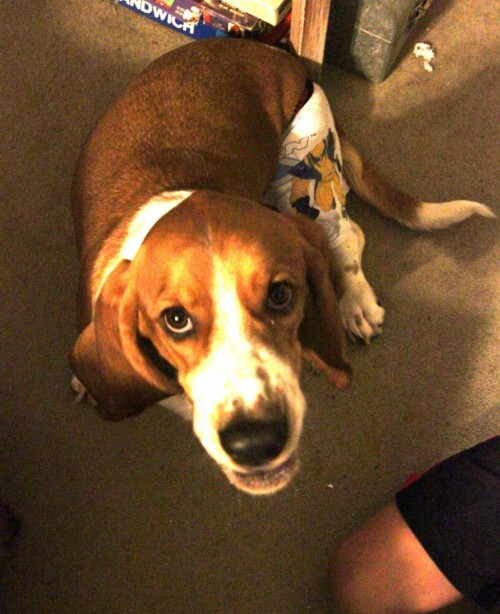 Yes, I will do this again. And, yes, I am more enamored than ever with investing in little lederhosen with long suspenders for Mr. Oliver T. Puddington.